Now Tom Clancy’s Rainbow Six: Shadow Vanguard is an excellent iPhone app. Being the first shooter game I played on my new iPhone 4S, I was pretty impressed as I was preparing this review. Just a note – I didn’t get to try it out on the latest iPod Touch. It’s a pretty straightforward shooter, a genre that many people are used to. You basically go through missions in a tactical team, taking down the bad guys, rescuing politicians and civilians, and you also get to blow stuff up. The storyline was something I really wasn’t paying attention to as I played this game, as I was pretty much focusing on the experience itself. I started things off with the Steel Wind mission, and the first thing I noticed was the slick intro to the level, similar to the Call of Duty level intros on consoles. Then there were the cinema scenes following the mission briefing. Of course, the graphics weren’t the best, even on an iPhone, but the framerate was really smooth. It seemed like 60 frames per second to me. That’s probably thanks to the improved iPhone 4S graphics chip. The in-game graphics are okay, although pretty good for a mobile application. Think Playstation 2 graphics but with a really smooth framerate. Character models are great, yet up close, textures of the scenery in the level can be rather grainy. In regards to the controls, I played this mission three times to get a feel for only using the gyroscope aiming, playing without the gyroscope aiming, and a third time to play with a hybrid of both aiming styles. Using only the gyroscope was a pain. I basically had to play standing up and turn my body to navigate through the levels and aim at my targets properly. Basic aiming with your fingers is cumbersome as you have to stop aiming with your thumb to press the fire button. The ultimate control setup is to use your thumb to turn your character left and right then use the gyroscope aiming to finesse the targeting on your enemies. The controls felt perfect and seemed like I was playing a shooter on a console. Rainbow Six: Shadow Vanguard’s shooter mechanics really impressed me. Tapping onto icons to hide behind objects, climb over obstacles, direct your squad, and to utilize spy tools through doors felt right to me. 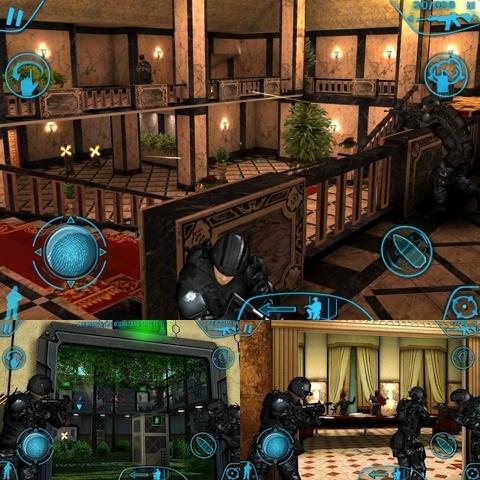 The tactical vibe was translated well into this mobile first person shooter. I really felt immersed in the level as I was leading my team through the Steel Wind level. The solid gun sounds and the epic soundtrack added to the experience. The level wasn’t designed that well when it came to the cookie cutter rooms that looked alike. Fortunately, there’s a navigation arrow at the top of the screen to prevent getting lost in these clone-like rooms. When I finished the level by flanking the terrorist and taking him down with a headshot to prevent an assassination, I felt really satisfied with the experience. Between the smooth graphics, fun aiming controls, and the immersive tactical team gameplay, I’d highly recommend Tom Clancy’s Rainbow Six: Shadow Vanguard. 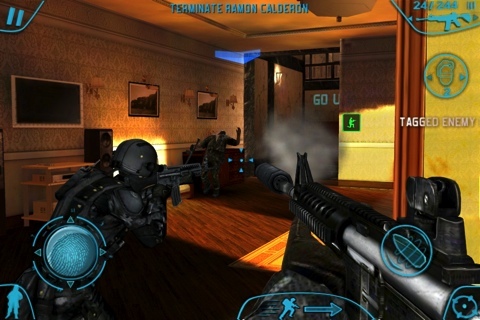 AppSafari review of Tom Clancy’s Rainbow Six: Shadow Vanguard was written by Darius Reimm on December 24th, 2011 and categorized under Action, App Store, First Person Shooter, Fun, Games, Strategy. Page viewed 6519 times, 1 so far today. Need help on using these apps? Please read the Help Page.